The earliest "Jacobson Machine Manufacturing Co.", ad I've seen is from the Warren Evening Democrat and is dated May 25, 1900. There is no indication that they made engines at that time. In another book I found a mention that Jacobson Machine Mfg. was "organized" in 1901. I still have not found an ad prior to 1906 indicating that they (Jacobson) made engines. I am looking for someone having access to a copy of "Gas Power" dated May 1909 who would be willing to scan and send me the color ad depicting a Jacobson "Mascot" engine. Hi Don, no, I was looking specifically for the color ad in the May 1909 Gas Power magazine or any other issue with the same ad. Here are my pics. I emailed the same to you Dennis. I bought it this summer at an estate sale, it was the only engine. Thanks Steve for finding time to send in the data and pictures of your engine for the Jacobson registry. I've entered it to the registry which you can find here: http://buzzcoil.brinkster.net/moody/000index.html along with all the other pages I've put together for the Jacobson engines and some of its history. I also want to thank Don Worley for much of the stuff on Jacobson he is sharing with me and with all of you at the same time. I want to extent an invitation to all Jacobson engines owners to send me info and pictures which I will promptly add to the Jacobson registry. Included in this registry are the Ward, Bull's Eye, Unito, Maynard and all the other engines built by Jacobson in Warren and in Titusville. Here are my pics. I emailed the same to you Denis. I bought it this summer at an estate sale, it was the only engine. Last edited by Denis Rouleau; 12-05-2013 at 12:39:38 PM. 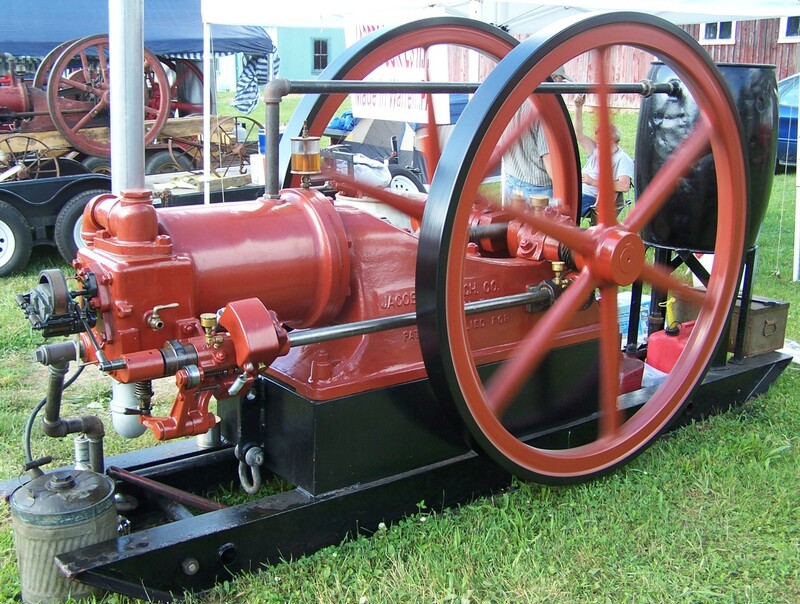 I have to show you the oldest (for now at least) and the biggest Jacobson engine (25hp). I have some Gas Power, but do not have that one. Thanks Len for the suggestion. I've been closely following Jeff's thread about vintage ads from Gas Power but I don't think I've seen anything about Jacobson. Jacobson engine ads are few and far between, contrary to some other engine builders that advertised everywhere and regularly, Galloway to name one. Len, if you have anything/something for Jacobson in the Gas Power you have I would sure like to see it. This invitation is to everyone with any vintage magazine with Jacobson ads in them. Sales literature is also great to tell what was available from a certain engine manufacturer but they often is no mention of the year the literature was issue. Ads in magazines are great as you know when it was issues right down to the month/day/year. So don't be shy and please email me anything you see pertaining to Jacobson Machine Mfg., Warren Pa. I will create web pages with these ads and share the result with everyone. 5 HP "Ward" sn 3582 gov on sideshaft May 18, 1912. I am now watching this site regularly, so if you have any questions, ask. Last edited by Don Worley; 12-08-2013 at 11:25:27 AM. The Jacobson Machine Mfg. Co. plant in Warren, Pa. was destroyed by fire on March 23, 1923. They were opening a barrel of gasoline and it ignited and burned them and most of the buildings housing the engine portion of the business burned down. The Warren Gear portion did not. Since the engine portion of the business was small at the time the owners of the engine business were forced to move. A factory was located in nearby Titusville shortly after. Here is the oldest know Jacobson (to me). It is engine #1020 which is believed to be the 20th Jacobson built as Don is inclined to think that Jacobson engines started at engine #1001. I was not able to tell for sure in what year Jacobson built their first engine but I've found evidence that they were building engines in 1904. Don, do you have indication that Jacobson built engines prior to 1904? I do not have any proof, but local legend says possibly 1901. The earliest proof in print and other local legend is 1903-1904. It would not seem practical that an engine such as 1020 was one of the first engines made. It would be more logical that production started with the 4 HP oilfield engines on a trial basis. Charles Jacobson didn't get much financial backing until about 1903, and by about 1907 he was no longer a main character in the company. If so can you provide me with the serial number and hp for the Jacobson registry? Do you have enough information to start to estimate the breakdown in manufacturing dates for the listed engines? I can't speak for Don as he has been around Jacobson engines for a long time and he might have more relevant information that might help tell when a certain engine was built. Myself, I am not in a position to determine when a Jacobson was built right now BUT when we reach the 100 to 125 engines in the registry I am sure I will be able to give a good estimate as to when most Jacobsons were built. So please keep registering your Jacobson engine(s) and sending in Jacobson ads from old magazine. 1- engines built prior to Ward being associated with Jacobson. 3- after Ward, United and William started selling other brand of engines. Seems to me that a good percentage of Jacobson engines were built during the second period. All times are GMT -4. The time now is 11:58:00 AM.